This is great practice before a quiz, test or a writing assignment. This activity can also be done within a small group. Each student in the group can write one or more sentences. 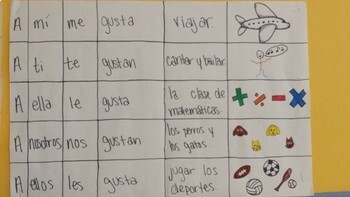 Students create their own chart using the indirect object pronouns, the verb gustar and the infinitives. Next, students write sentences using the structure of the indirect object pronouns, a form of the verb gustar and an infinitive. Students are asked to draw a picture to represent their sentence. The grading rubric is included.